PanARMENIAN.Net - U.S. ambassador to Israel, David Friedman, said in remarks published on Thursday, September 6 he expected Israel to keep the Golan Heights in perpetuity - an apparent contradiction of a statement made by Trump's national security adviser John Bolton during a recent visit to Israel, Haaretz reports. Foreign governments, including the United States, do not recognise Israel's claim over the strategic plateau captured from Syria in a 1967 war. However, Friedman suggested Israel was there to stay and said it was possible the United States would consider recognising Israeli sovereignty over the Golan Heights in the future. "I personally cannot imagine a situation in which the Golan Heights will be returned to Syria. I frankly cannot imagine a situation in which the Golan Heights is not part of Israel forever," he told the right-wing Israel Hayom newspaper. Friedman said there was "no one more undeserving of this prize" - control of the Golan Heights - than Syrian President Bashar al-Assad. Since early in Trump's term, Israel has lobbied for formal U.S. endorsement of its control of the Golan. 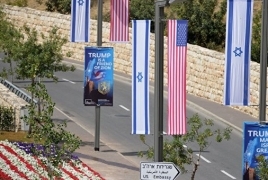 Trump has recognised Jerusalem as Israel's capital, breaking with other world powers, but national security adviser John Bolton said last month a similar Golan move was not under discussion.